Every dog wants to be pampered and our grooming staff knows just how to pamper them right! Your Pet Can Be A Part Of Your Big Day! Going Away For A Holiday? CHECK OUT THE 2019 DEPOSIT REQUIRED DATES! Who can love your pets as much as you? Having cared for and loved their own dogs for over 27 years, and after 10 years of successful dog boarding at their home, Mary & Stan Pfoff knew what they wanted to see in a pet boarding facility. 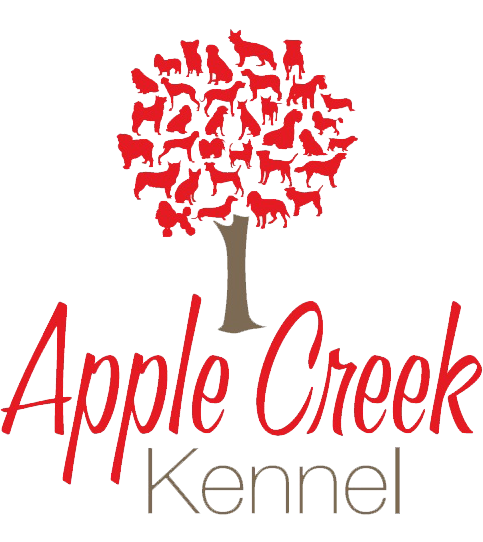 They created Apple Creek Kennel as a home away from home - a place they would feel comfortable boarding their own pets. WHAT WILL YOUR PET ENJOY? Think of us as your dog's home away from home! Your dog will enjoy their own spacious kennel, round the clock care from our 24 hour staff, year-round climate controlled rooms utilizing a specially designed heating and cooling system and regular trips outside for potty breaks. Breakfast, lunch and dinner are served using your dogs food and treats from home! Daycare days full of fun and activity can keep your dog busy all morning and afternoon. There's always something to do whether it's playing with toys, wrestling, jumping in the pools, or just laying around getting some love, your dog will never be bored!